Tests should be independent and repeatable. It’s a pain to debug a test that succeeds or fails as a result of other tests. Google C++ Testing Framework isolates the tests by running each of them on a different object. 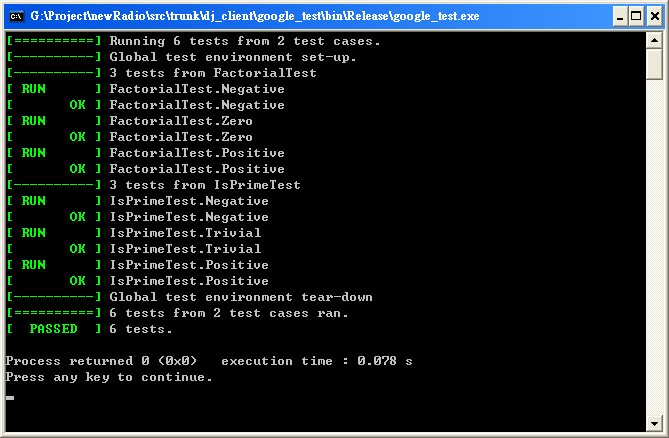 When a test fails, Google C++ Testing Framework allows you to run it in isolation for quick debugging. Tests should be well organized and reflect the structure of the tested code. Google C++ Testing Framework groups related tests into test cases that can share data and subroutines. This common pattern is easy to recognize and makes tests easy to maintain. Such consistency is especially helpful when people switch projects and start to work on a new code base. When tests fail, they should provide as much information about the problem as possible. Google C++ Testing Framework doesn’t stop at the first test failure. Instead, it only stops the current test and continues with the next. You can also set up tests that report non-fatal failures after which the current test continues. Thus, you can detect and fix multiple bugs in a single run-edit-compile cycle. The testing framework should liberate test writers from housekeeping chores and let them focus on the test content. Google C++ Testing Framework automatically keeps track of all tests defined, and doesn’t require the user to enumerate them in order to run them. Tests should be fast. With Google C++ Testing Framework, you can reuse shared resources across tests and pay for the set-up/tear-down only once, without making tests depend on each other. // Returns n! (the factorial of n). For negative n, n! is defined to be 1. // Step 2. Use the TEST macro to define your tests. 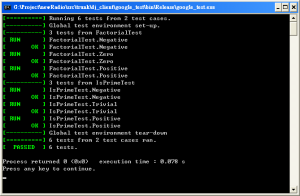 // TEST has two parameters: the test case name and the test name. // examples of such macros. For a complete list, see gtest.h. // into the same test case. // identifiers. And you should not use underscore (_) in the names. // that their results don't depend on their order. // Tests factorial of negative numbers. // Prints elapsed time by default. // This allows the user to override the flag on the command line. This entry was posted in C/C++, 中文文章, 分享 and tagged C++, Google, Unit Test, 單元測試, 測試. Bookmark the permalink.